Sajal Ali is a Pakistani actress noted for playing a variety of characters in a range of serials from contemporary social to romantic dramas. The chirpy, vivacious actress is best known for acting in diverse array of serials which includes both romantic as well as contemporary social dramas. She was born and brought up in Lahore Pakistan. Talking about her career, Ali’s first appearance on screen was a minor role in one episode of the 2009 Geo TV’s comedy drama Nadaaniyaan. She received praise for her breakout role in the 2011 ARY Digital’s family drama Mehmoodabad Ki Malkain. Subsequently, she rose to prominence for portraying leading roles in several of the successful television series. These TV shows include the comedy Mohabbat Jaye Bhar Mein (2012), the romances Sitamgar (2012), and Meri Ladli (2012), the family comedy Quddusi Sahab Ki Bewah (2013), and the drama Gul-e-Rana (2015).Her performance in the teen drama Nanhi (2013), the psychological Sannata (2013), the revenge drama Chup Raho (2014) and the spiritual romance Khuda Dekh Raha Hai (2015), earned her widespread recognition as well as the Lux Style Award for Best Actress nominations. 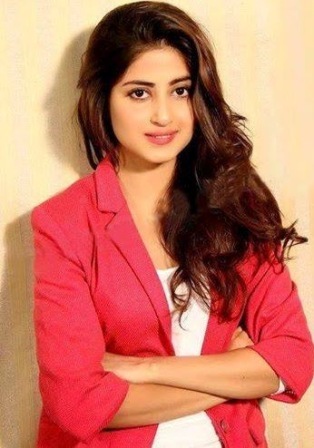 Sajal Ali garnered critical acclaim for portraying a troubled child in the telefilm Behadd (2013), and an aspiring actress in the relationship drama Zindagi Kitni Haseen Hay (2016), her first feature film.. She will make her Bollywood film debut starring opposite Sridevi in the 2017 film Mom. Talking about her family, Sajal Ali has one sister called Saboor Ali and in 2017 Ali’s mother passed away due to cancer. Apart from this, she has promoted many popular bridal wear and fashion accessory brands.